After La Paz, Cabo San Lucas is the largest city in the Mexican state of Baja California Sur. The primary industries in the city are tourism and fishing. Since the first commercial fishing platform was built here in 1917 to catch tuna, the city has gained a reputation as one of the premiere destinations for fishermen, both serious and amateur. If you are going to take a vacation to Cabo and would like to do some serious fishing, consider renting a Cabo San Lucas fishing charter. There are many sizes and varieties available to you and each has the ability to help you catch more fish, whether you're angling for big game or just playing a game of catch and release. For those new to the game, or for those who simply want to have a good time while they fish, chartering a seat on our 70' party boat may be the perfect Cabo San Lucas fishing charter. The boat has more than enough space to accommodate even the largest of parties with plenty of room left over and comes complete with numerous chairs for relaxing in between bites. If you get tired of fishing, take to the deck and work on your tan or head down to the galley to grab a drink. And because party boats are a Cabo San Lucas fishing charter open to those who make reservations, you never know whom you might meet and befriend. If you desire a little more personal attention, peace, and quiet with your fishing, then renting a sportsfisher is the solution to your Cabo San Lucas fishing charter needs. From its engine to its reels, rods, and tackle, everything on our sportsfisher vessels is high tech and top notch. Perhaps the best part about chartering a sportsfisher from Cabo Fishing Fleet is working with our knowledgeable and friendly captains. These guys know what it means to fish in Cabo San Lucas and they've been doing it right for years. Working with one of our captains, you will learn where the fish hide and how to catch them. If fly-fishing is your game, then a Marlin Master from Cabo Fishing Fleet is exactly the Cabo San Lucas Fishing Charter to fit your needs. From just off the coast of Cabo, you and an experienced instructor will spend time teasing the top of the water enticing the fish below to take the bait. Perfect for novice and advanced fishermen. 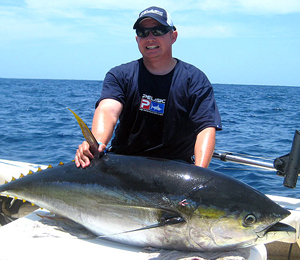 If you are planning a trip to Cabo San Lucas, let the experts at Cabo Fishing Fleet help you get out onto the ocean for some of the best fishing this world has to offer.